Episode 2 is now available for download: Agassiz, Inc. Please share far and wide, early and often. Thanks! This week I speak with biographer Christoph Irmscher about the legacy of Louis Agassiz, one of the most influential men in the development of the practice of science in America. Irmscher’s book is called Louis Agassiz: Creator of American Science. 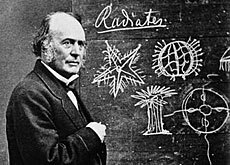 Louis Agassiz, a co-discoverer of the Ice Age, is often portrayed as a racist proponent of miscegenation and a failure as a theorist of human development–as the scientist who refused to see species in the light of Darwinian evolution on religious grounds. But as our guest the biographer Christoph Irmscher shows, Louis Agassiz was one of the most influential men in the development of Amercian Science.